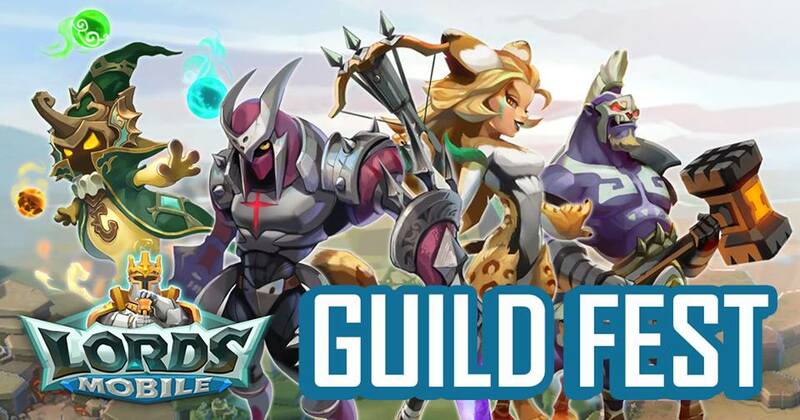 Lords Mobile: Guild Fest, Here We Go Again? It's that time of the month when you NEED an active participation of your guild. The more points you collect as a team, the higher your chances are of having a high tier and thus, more interesting rewards. You need to have 25 members to be able to participate in this event. Each player will have 6, 7, 8 or 9 attempts depending on which gauntlet you are (you can buy 1 last attempt for 1000 gems), and every time you chose a quest, you need to finish it in order to obtain the points. If you cancel or couldn't fulfill the mission during the time given, you won't gain the points and will lose an attempt. But if you look closely at the rewards, you might think it's impossible to reach tier 20, it requires a huge amount of points! And indeed, it's true you need a lot of points, but in the word “impossible” there's also the term “possible” and therefore do-able. Depending on the number of players the guild has, it is possible to make an estimation of the points required to reach a certain tier level. It would be ideal that each player grabs a quest of 100 points or more (like I said it's ideal but not compulsory). That's when you say: YOU CRAZY! But, in fact, it's achievable! That's when the leader and r4s come into action. Indeed, they are the ones responsible of “refreshing” (even though the real term is erasing) the quests that are too impossible to fulfill (like reach solo top 70 or hell event top 70 and those should be removed from the list) or those that grant a few amount of points (46 to 90 pts). So, how to proceed during the guild fest? R5 and r4s should be on alert (doesn’t mean you have to stay awake all night long or to forget about living your life) and “refresh” the quests every time they see : impossible quests or missions that give a few amount of points. Put temporary r4s on command to help out as much as posible and keep the board refreshed and cleaned. For those f2p out there like me, there are plenty of quests to do and that is within our reach. It takes time, discipline and patience. Save up your admin/guild scrolls, speed ups and gems, energy, guild coins, etc. Everybody is competing against each other within the guild as you've probably noticed, but that's good. Means the job is getting done. As for the points, 1100 pts is doable without spending a dime on it. Another thing to take into account is that the guild fest is just right after kvk (Kingdom vs Kingdom), and most of the turfs are in the process of healing their troops. You have 6 days to fulfill this event, so don't rush and finish your quests at your own pace. This event requires an active participation of everybody. A higher score means better rewards at the end and a better position in the rankings.